Skin is a vital organ. Like your heart or your lungs. It is also your first line of protection against assaults from the outside. Still, your skin is not a suit of armor. 1. Building the skin's tolerance. 2. Preventing and correcting the effects of ageing. 3. Protecting the skin against environmental aggression. All Vichy products are formulated to meet these three key principles. They offer the unique dermatological virtues of Vichy thermal water associated with specific active ingredients : Mexoryl SX or Aminexil. Vichy was founded in 1931 by Georges Guerin, a cosmetologist who was visiting the renowned spa city of Vichy in central France. Guerin discovered the healing capabilities of its thermal spa water while recovering from an accident. He would go on to feature the water in a collection of skin care products, and named the range Vichy in honour of the special city. Innovative, efficient and scientific, these products were unlike anything else at the time. The collection was also split into specific skin types of dry, oily and dehydrated, a now-habituated system that was first pioneered by Vichy. Together with the dermatological benefits of the thermal spa water, Vichy products also utilised both natural and scientific ingredients in their formulations. Vichy has accrued over 80 years of expertise and innovation in their field, evolving from one visionary doctor to an entire global network of medical experts. 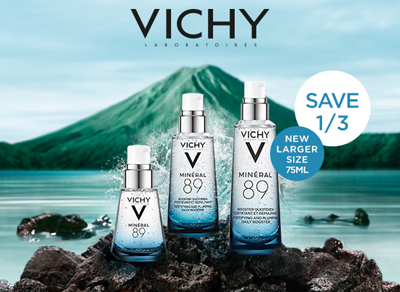 With a focus upon safety, innovative technology, knowledge, and efficacy each and every one of their products is still infused with the extraordinary soothing and fortifying power of the Vichy Thermal Water.